Heat oven to 375°F. Line large cookie sheet with cooking parchment paper; spray paper with cooking spray. Unroll dough and separate into 8 triangles. Place 1 peanut butter cup in center of 1 triangle. Gently stretch corners closest to and farthest from cup together at top of cup, pinching edges together to seal around cup. Pull up third corner; firmly pinch edges to seal. Place on cookie sheet; twist 2 longest tips of dough to make ears. If desired, bend down longer ear. Repeat with remaining dough triangles and peanut butter cups, shaping and trimming dough as needed for desired shape. Bake 8 to 9 minutes or until puffs begin to brown. Place 2 white miniature marshmallow halves and 1 pink marshmallow half on center of each for bunny nose. Bake 1 to 2 minutes longer or until puffs are golden brown and marshmallows are slightly puffed. For eyes, immediately place 2 blue baking bits on white miniature marshmallows for pupil; remove puffs to cooling rack. Any bite-size candy or a large marshmallow can be used in place of peanut butter cup. If using a marshmallow, take extra care to seal dough securely because marshmallows will puff up during baking. 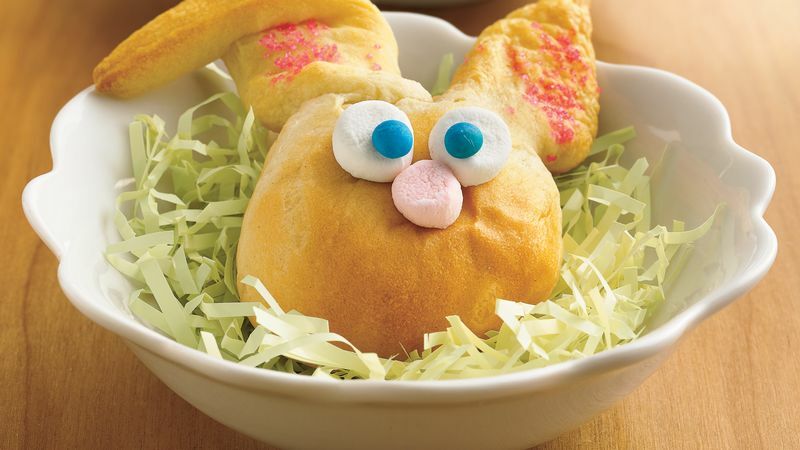 For extra decoration, sprinkle pink sugar on the bunny's ears.